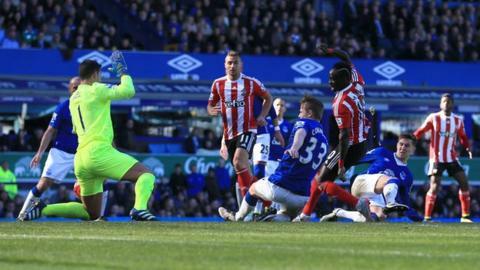 Southampton's hopes of a European spot suffered a setback as they were held to a draw at Everton. The visitors went close when a Shane Long header and a Dusan Tadic left-foot shot came off the woodwork. However, centre-back Ramiro Funes Mori gave the home side the lead against the run of play with a deflected shot off Ryan Bertrand. Southampton equalised when Sadio Mane swept in a shot and had to settle for a point despite plenty of pressure. How did Everton warm up for a big week? The dissent has been growing when it comes to Everton manager Roberto Martinez and the smattering of boos at full-time will have reminded him off that. His side play Merseyside rivals Liverpool in the Premier League on Wednesday before a trip to Wembley for an FA Cup semi-final against Manchester United - two games which will either help his cause or add to the pressure on him. Against Southampton, injury concerns and a suspension for midfielder James McCarthy saw him make six changes from a draw against Crystal Palace and his side spent most of the game fending off the south-coast side. Striker Romelu Lukaku was not risked off the bench, although right-back Seamus Coleman having to go off injured with a hamstring problem will be a worry. "It will be hard to see him being involved this week as that sort of injury takes longer than a week," said Martinez. Martinez gave teenagers Callum Connolly and Tom Davies their debuts for the club and, despite his squad being stretched, the Blues earned a hard-fought point. And, even though the draw did bring an end to a run of three successive home league defeats, Everton remain without a win in their past six top-flight games. Can Saints make a late surge for the top four? Before the match, Southampton manager Ronaldo Koeman had not ruled out the chance of his side finishing in the top four and possibly qualifying for the Champions League. However, those hopes appear all but over as Saints are six points off fourth-placed Manchester City having played two games more going into their last four matches. They had a chance to win at Goodison Park in the league for the first time since 1997 but failed to capitalise on Everton's personnel problems. Southampton spent more than twice as long as Everton in the opposition third but failed to make the most of their pressure. "If you look at the away goals that is the problem," said Koeman. "We have scored 14 goals away and that is not good enough." Everton manager Roberto Martinez: "When you have to make five or six changes to our starting line-up, we look disjointed, rusty, and needed to find our normal rhythm. We overcame that lack of quality with incredible fight to get a positive result. "Looking at our results at home, they are not anywhere near what is expected. We need to turn that around starting with understanding that the responsibility of being at Everton is to win games on a consistent basis. We haven't been producing the results and I accept the unrest." Southampton manager Ronald Koeman: "I'm really disappointed because it was a big opportunity to win the game, right from the start. We had a lot of space to play but in the final part it wasn't good enough. "At least we had a good reaction to going behind. We got one point but at this final part of the season it is not enough. We want to fight for Europe and it is not a step forward." Southampton have gone eight league games without a clean sheet, after a run of six consecutively. Sadio Mane scored for only the second time in his past 23 Premier League appearances for Southampton. The Toffees have won just one of their past 10 Premier League games at Goodison Park (W1 D3 L6). Everton have won just 17 points at home this season in the Premier League - their previous worst tally in a single season was 25 in 1996-97, which they can no longer reach this season. Callum Connolly (18 years, six months and 24 days) is the youngest player to make their Premier League debut for Everton since Ross Barkley (17 years, eight months and 15 days) in August 2011. Everton will make the short trip across Stanley Park to play Liverpool on Wednesday, while Southampton's next game is a trip to relegated Aston Villa on 23 April. Attempt missed. Ramiro Funes Mori (Everton) left footed shot from outside the box is too high. Assisted by Ross Barkley. Attempt blocked. Kevin Mirallas (Everton) right footed shot from outside the box is blocked. Assisted by Ross Barkley. Jay Rodriguez (Southampton) is shown the yellow card. Foul by Jay Rodriguez (Southampton). Ross Barkley (Everton) wins a free kick on the left wing. Substitution, Everton. Tom Davies replaces Darron Gibson. Arouna Koné (Everton) wins a free kick on the left wing. Bryan Oviedo (Everton) wins a free kick in the defensive half. Offside, Southampton. Ryan Bertrand tries a through ball, but Sadio Mané is caught offside. Attempt saved. Sadio Mané (Southampton) right footed shot from the left side of the six yard box is saved in the bottom left corner. Assisted by Steven Davis. Corner, Southampton. Conceded by Joel Robles. Attempt saved. Jay Rodriguez (Southampton) right footed shot from the right side of the box is saved in the top centre of the goal. Assisted by Cuco Martina. Attempt blocked. Shane Long (Southampton) right footed shot from the left side of the six yard box is blocked. Assisted by Jordy Clasie. Attempt missed. Jordy Clasie (Southampton) left footed shot from the centre of the box is close, but misses to the left. Assisted by Sadio Mané. Goal! Everton 1, Southampton 1. Sadio Mané (Southampton) right footed shot from the centre of the box to the bottom right corner. Assisted by Dusan Tadic. Cuco Martina (Southampton) wins a free kick in the defensive half. Substitution, Southampton. Jay Rodriguez replaces Victor Wanyama. Goal! Everton 1, Southampton 0. Ramiro Funes Mori (Everton) left footed shot from the centre of the box to the centre of the goal following a corner. Attempt missed. Ramiro Funes Mori (Everton) header from the centre of the box is close, but misses to the left following a corner. Corner, Southampton. Conceded by Bryan Oviedo. Jordy Clasie (Southampton) wins a free kick on the left wing. Substitution, Southampton. Steven Davis replaces Graziano Pellè. Substitution, Everton. Ross Barkley replaces Gerard Deulofeu. Attempt missed. Graziano Pellè (Southampton) right footed shot from very close range is close, but misses to the right. Assisted by Cuco Martina with a cross. Attempt saved. Kevin Mirallas (Everton) right footed shot from outside the box is saved in the top centre of the goal. Leon Osman (Everton) wins a free kick in the attacking half. Corner, Southampton. Conceded by John Stones.